I would not put Augustine’s doctrine of evil into the Church’s creed. I have no right to impose it on others. I think it is an essential. But into the ‘credo’ I do not thrust it. Systematic theology has a wide margin round it, where we must have the probabilia placed; but the creed should have none. A narrow theology, founded on the theologian’s idiosyncrasies, is, after all, no theology at all. So said John ‘Rabbi’ Duncan. That’s the theme of what follows, as applied to Confessions, and then to this theological hinterland of what Duncan calls probabilia, probabilities. The official Reformed theology is a balancing act. In practice that theology pivots on one confession or another, particularly, for Anglophones, on the Westminster Confession. One of the things that the recently-published volumes on the work of the Westminster Assembly has brought home is the adventitious or accidental aspect of the Confession, the way it was composed, what was put in and what left out. (Chad Van Dixhoorn (ed.) The Minutes and Papers of the Westminster Assembly, (OUP, 2012)). The finished product was influenced by the pressure of time, the opinion of the majority of divines who on a particular day happened to be attending a committee or sub-committee, parliamentary pressure to get a particular job done, interruptions, and no doubt the mood of the meetings. Together with the clashes of personalities, the hobby-horses, and so forth. Cold print cannot convey this. In such circumstances, in the messiness of human life, the articles that resulted, chapters in the Confession, were a series of compromises, clause by clause in some cases, and we must remember that. As the debate on one matter was brought to an end, and a majority were content with some particular wording, a minority or minorities were not content, or not as content. In the nature of things confessions and creeds are forms of compromise draftings that attract a majority on a particular day. So confessions and even the more basic creeds of the church are political documents, ‘articles of peace’, what the chaps could agree on that particular occasion. Part of this disagreement was over what topics should be treated in a confession, and what not. Had the divines met a week earlier or later things may have been, or would have been, different. In this process we no doubt see the workings of an inscrutable providence which has regard to the least nuance, the crossing of each t and dotting of the i’s. In this sense the final form of a particular text was ‘infallibly decreed’. But what is divinely decreed is human compromise. Behind that confessional agreement, and the dissent of the minorities from the majorities, it is clear that there is a vast hinterland of theological opinion, (theologoumena). Private conjectures. Not simply Duncan’s probabilia, but more than the purely speculative. What one thinks is a good and necessary consequence of the teaching of Scripture others may not. What some may think ought to find its way into a Confession others may dissent from. All right, it is all godly opinion, (as we may suppose) but it is what you get when trained people with different opinions are brought together. The Confession may or may not imply any of these opinions, more likely it may permits them. Richard Muller has recently shown what variety of opinion there is regarding the death of Christ. (Calvin and the Reformed Tradition: On the Work of Christ and the Order of Salvation (Baker, 2012) If we think of all this mass of different points as a web, there is a central core, the Creed or the Confession, and a vast surrounding area, not holding the centre in place, as in a spider’s web, but a penumbra of opinion, which may have any of several relations to the core. Perhaps the core entails this opinion, or allows it, or make the holding of it reasonable. Or maybe there is stuff in the hinterland that has nothing to do with the core. Either way, there should be about a Confession a catholicity of spirit and expression, reflecting the general Biblical scheme of Creation, Fall and Redemption, and the absence of idiosyncrasy or an individual’s or group’s peculiarities. If the production of the Confession has ragged edges, how much more is it the case in the matter of theological opinion, what I call the hinterland. To illustrate this, let us take an example from an illuminating recent piece by Mark Jones which raises the question of the nature and place of grace in the original Adam’s life, among the Puritans. In particular whether this grace was a gift of the Holy Spirit, and in what sense. (We must bear in mind that the concept of a covenant of works, though a central motif of the Confession, is itself a theological construct the elements of which are not clearly present on the surface of things in the Genesis account, and the Holy Spirit never once mentioned in the relevant passages of Genesis). And that in turn raises questions about Adam’s responsibility, and the nature and place of merit in the covenant of works. Two motifs should control the answer, that Adam’s original state was ‘mutable’ and that it resulted in what is sometimes called the loss of the image ‘in the narrow sense’. (Here we take these positions for granted, as being generally held, but they themselves are capable of fine tuning). And there is the abiding difficulty of understanding in what sense or senses 'nature' and natural' are used in discussion of these matters. The scene is therefore set for many possibilia. So, given all these caveats and qualifications, what are we to think about this matter of the Holy Spirit and Adam? How are we to proceed? What (it seems) the divines mentioned by Mark do is take different instances of the work of the Spirit from elsewhere in Scripture and discuss the status of unfallen Adam in the light of them. Here are four such instances. There is the work of the Spirit in calling and regeneration; then the periodic and spasmodic operations of the Spirit on evil men, such as King Saul; then the Spirit’s work in giving to people unusual gifts which do not seem to have to do with regeneration, like those craftsmen engaged in the building of Solomon’s Temple; and finally there is the reprobate’s tasting of the Spirit, as in Hebrews 6.4. No doubt we can find more cases. For example, there is the work of the Spirit in the ministry of Jesus Christ (John 3.34). Was unfallen Adam’s life a life of faith? Did he trust the promise of God given in the Garden? Yes, and no. His condition was unique, proceeding ‘very good’ from the hand of his Creator but ‘mutably’ so. He has grace, and if we think of that grace as being the gift of the Spirit, the Spirit is resistible and was repudiated, It was not that grace that ensured his perseverance in the original position, even though such gracious influence, persevering grace, could have been give to Adam, as it is given to the fallen elect. Neither was ‘deserved’ by its recipient, but one was preserving grace (as we might call it) suspended on the continued innocence of Adam, the other was regenerating effectual grace, designed to bring its recipient to glory. So was Adam’s faith ‘temporary’ faith, the faith of a mere professor? Well (again!) Yes and no. Adam’s original innocence was certainly temporary, as what befell him makes clear. But it was not , presumably, the temporary faith mentioned in Jesus’s Parable of the Sower. What of the temporary ‘gifting’ of the Spirit that may grant special gifts to a person, say the gift of designing things, for a period of his life, but such giving and withholding acts in the realm of what some call ‘common grace;’ appear to be actions of pure sovereignty, where questions of fittingness and unfittingness do not arise, much less desert or merit. What all this meandering shows is that we are trawling presently through the hinterland. where not only good and necessary consequences operate, (what are these?) but a good deal of conjecture and even speculation may also be at work in the thinking of the ‘godly’. (Nothing wrong with this, provided it is recognized for what it is). Whether the divines recognized this, their opinions of the Fall and the place of the Spirit in it, (to take one example being currently discussed) were just that: opinions. If they sought to make these opinions a part of the meaning of the Confession they ought to be resisted. The Confession is what it is and not another thing. One of the factors that makes a theologian is the exercise of judgment, particularly judgment about himself and then, naturally enough, judgment of others. Particularly a judgment between a central plank of the doctrine of the gospel, and a personal quirk. There are big issues and small issues. A Confession is not infallible, of course, but it is a good guide to the overall shape of things, providing a ‘system of doctrine’. What falls outside that Confession may be illuminating, suggestive, profitable to some theologian and his friends, or to some Seminary and its curriculum, but it ought not to be raised to the status of the Confession itself and the ‘system of doctrine’ that it propounds. Sometimes one has the impression that one motivation that some have for engaging in Reformed theology in the way that they do is in order to extend the boundaries of the official Reformed theology. I hope I'm mistaken. Despite the all-too-human character of the Confession, as a result of its adoption by certain churches, for many it delimits the shape of Reformed doctrine, and for others who do not subscribe to it is has a great deal of prestige. We are free to dissent from it, in whole or in part. In matters beyond the Confession we are free to think and to let others think. That’s how it was in Puritanism, as Mark Jones ably shows. And that’s how it should be with any adherent to the Confession nowadays. Here is what I think, (without much research to back it up - a hunch, therefore). In the period of Puritanism (or confessional Calvinism) in England between the 1620’s (when Ames’ Medulla, first given as lectures in Holland while an exile there, was published), and the calling of the Westminster divines, a significant change seems to have occurred. The divines were assembled by the Long Parliament to revise the 39 Articles of the Church to England and in time they were charged with the task of promoting it as the ‘church established’ with a presbyterian polity. The Westminster Confession and Catechisms were the most significant lasting consequences. Of course in this period of upheaval very many changes occurred, but the one that concerns me here is the expression of sanctification, and particularly the prominence that the place of the law as a rule of living in the Christian life, the so-called third use of the law, was emphasised. There was a conflation of the law in its function of keeping order in society, and its place in the life of the church. The Reformed view is that the law is to restrain evil, and to show men and women their need, and to be a rule of life. So chief among the requirements of the Christian life is the duty to keep the moral law expressed in the Decalogue and endorsed by Christ and the apostles. We shall not be concerned with any real or imagined substantive change in what were regarded as the ethical norms of the law, and their place in the Christian life, and with how such norms should be conceptualized and expressed. The hunch that I have, which is certainly not the result of the deep trawling of documents, but fed by a comparison of only two documents, though each may fairly be called representative, though in different ways. 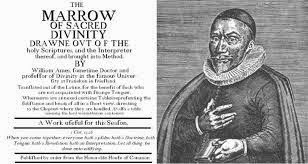 Ames is known for The Marrow of Sacred Theology, originally published in Latin and then translated into English in 1623. Comparing that with the Westminster standards reveals significant differences. It is the difference between the outlook of one such as Ames, who experienced exile, and that of the establishment, or of prospective establishment, of the church. I shall try to explain. In the time of Ames, the Puritans, who when they were allowed freedom and not being persecuted or repressed, were a vigorous, reforming party of the Elizabethan Church of England, interrupted by Mary, and harassed by Charles I. Ames’s life (1576- 1633) initially followed this sort of trajectory. Prosecuted by the bishop of London, the stalwart Calvinist George Abbot, for various Puritan leanings, Ames went to Holland in 1610, serving churches of English merchants. Some of his lectures became his Medulla, The Marrow of Theology, dedicated to them. There was an English translation, and numerous reprints. But as the arm of the bishop reached as far as The Hague, Ames lost support. However, he gained a Dutch appointment as professor of theology at Franeker. Efforts to move to Leyden were thwarted, again because of interfering English authorities. At Franeker Ames had Sibrandus, Lubbertius, Maccovius and Batholemew Keckermann as colleagues. Ames, a covenant theologian and supralapsarian, wrote extensively against Bellarmine, and produced his famous book Conscience: Its Law or Cases, translated into English and Dutch. Living in Holland during the period of the Synod of Dort, he wrote extensively on Arminianism. In the Medulla his own scholasticism is muted. In English translation the work largely consists of brief summaries of theological positions in what was a compendium of theology, not a set of elaborate discussions. What is certain is that Ames was concerned with the application of theology to Christian life. During this time Ames was urged to join the exodus to New England. Instead he became pastor of the Independent congregation in Rotterdam. After his home suffered flooding Ames suffered from fever and he died shortly after. (1633). His Medulla consists of two Books, the first on theology proper, and the second on practical theology. It is a work of covenant theology, though mildly so. In the first book there is a chapter on sanctification (29), and In book two one on virtue (2) and the graces of faith, hope, and love (5-7), and on justice and charity and honour to our neighbour, (16-18). There is no chapter on the law of God as expressed in the Decalogue. This is a dramatic change, the change from thinking of the Christian life as the pursuit of and formation of graces or virtues, with the emphasis on the Christian’s freedom (as in Paul in Galatians), and his or her resurrection with Christ, to thinking of Christian life it in terms of keeping the law, and of duty. If it is thought primarily in terms of keeping the law, then no wonder that the catechisms and filled with lists of new duties, and not at all surprising that the divines looked back to the Old Testament for these lists. Next time I shall look at this contrast between Ames's emphasis on virtue and Westminster's emphasis law in more detail, and consider each in relation to the balance of the NT between the two. I shall suggest that Ames’s approach, the approach of the exile, keeps the NT balance better than do the Westminster divines, working (as they were) on a blueprint for the establishment of a Reformed church, and with the prospect of such an establishment (as they thought) just around the corner.